If we’re going to talk about interior signs, then why are we showing you an exterior sign? Because both are important for your branding strategy. 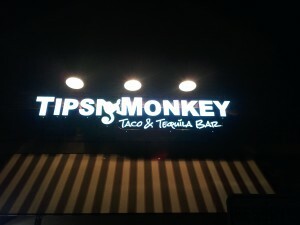 Below is a night shot of exterior sign work we did for the taco and tequila bar Tipsi Monkey located near Chicago in Bartlett, Illinois. Want your interior sign to look perfect? Then contact us or give us a call at (630) 289-7082. We serve Chicago and the surrounding area. Get noticed inside and out with Mark Your Space. Signage is an important part of any branding strategy. Even the kid who sells lemonade on the corner makes a sign to let everyone know what’s for sale. 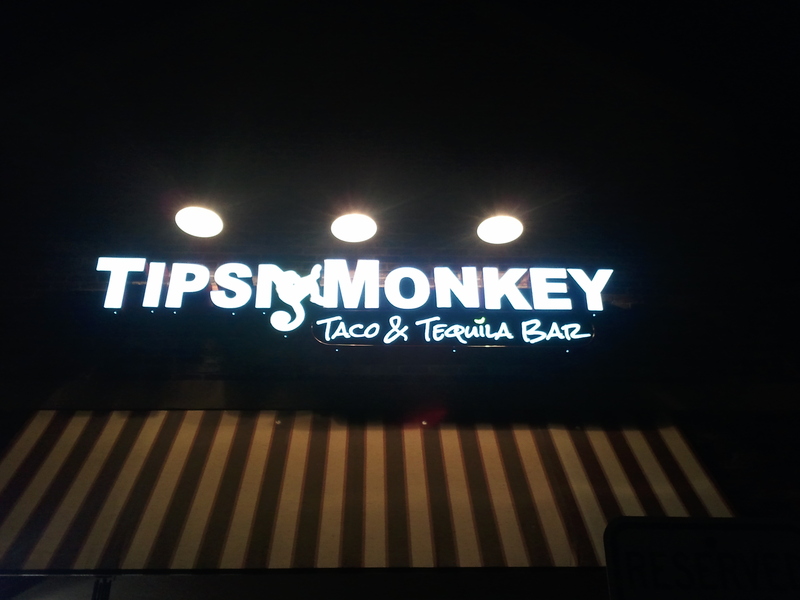 For your business, attractive well lit signage sets you apart from the competition. Meanwhile, the Tipsi Monkey website further solidifies the branding process. The mood is clearly lighthearted and friendly. Now you could leave your interior space sign free, but then you lose out on a unique chance to reinforce your image. Even subtle logo placement helps, such as with window frosting or wall signs. This space is free advertising space, and it pays to advertise within your business. Familiarity with a brand builds comfort and trust. It also helps keep your name in the mind of every customer to build brand loyalty. In a way, your are gently forcing visitors to look at an ad for your place. When people are sitting around drinking, eating, or shopping, they look around. The more they encounter your branding message, the more it sticks. An attractive sign is a continuously running ad that might last for an hour or more, depending on the length of your client’s visit. These impressions are worth the investment. Another advantage of indoor signage is cost. You put the sign up and it’s permanent. Well built signs last for many years. Plus, while your “audience” is inside your place, there’s no competition from other brands. 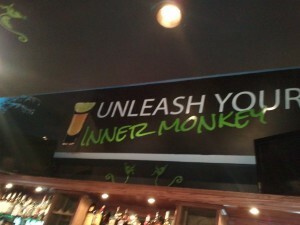 This gives further leverage to having your message within your establishment’s boundaries. Want to improve your branding strategy? Then contact us or give us a call at (630) 289-7082. We serve Chicago and the surrounding area.